Mix onion, ginger, crushed red pepper, curry powder, turmeric and Italian dressing in 8 x 8 x 2" glass baking dish. Add chicken; turn to coat with marinade. Cover and refrigerate at least 2 hours and up to 1 day. Remove chicken from marinade and reserve marinade. Pat chicken dry and sprinkle with salt and pepper. Heat olive oil in heavy large skillet over medium-high heat. Add chicken to skillet and sauté until brown, about 3 minutes per side. Add reserved marinade and chicken broth and bring to boil. Reduce heat to medium-low and simmer uncovered until chicken is cooked through, turning occasionally, about 6 minutes. 719 members have added this recipe to their cookbook. Use homemade dressing, not commercial. Have no idea why "soup" is flagged as Not Ok, unless it's referring strictly to commercial soups; home made bone broth is wonderful for you. 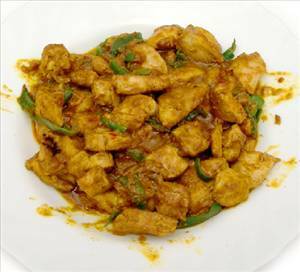 There are 191 calories in 1 serving of Indian Chicken Curry. Calorie break-down: 26% fat, 13% carbs, 61% protein.